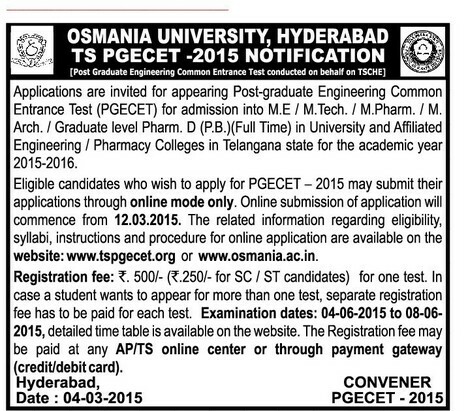 TS PGECET 2019 Telangana State Post Graduate Engineering Common Entrance Test (TS PGECET) is state level Common Entrance Test of Telangana State for admission into the regular PG courses in Engineering, Technology, Architecture, Pharmacy (ME / M.Tech./ M.Pharmacy / M.Arch ), Graduate level Pharm-D (Post Baccalaureate) conducted by University College of Engineering, Osmania University on behalf of Telangana State Council of Higher Education (TSCHE), a statutory Body of the Government of Telangana., Hyderabad. TS PGECET 2019 Application Form has been released on 6th March 2019. The dates given in the below table are final list of dates. 2) The Candidate should belong to the state of Telangana / Andhra Pradesh. 4) Candidate should obtain at least 50% marks (45% for reservation category SC/ST) in the qualifying examination. 5) It the candidate qualifying degree is obtained under distance mode education, then if must have AICTE/ Distance Education Council (DEC) approval. 1) TS PGECET 2019 Application Form will be completely online. 1) There will be a total of 120 questions for 120 marks in each paper with duration of 2 Hours. Each question carries 1 mark. 3) Questions will be of objective type with multiple choice questions. 4) Examination will be conducted in Offline Mode: Pen & Paper Based Test (OMR). 5) The cut-off mark in the Common Entrance Test is 30 marks, in case of SC/ST there is no minimum marks. 6) The Question Paper will be in English only. Detailed Syllabus of each test paper will be given at the TS PGECET official website on the release of official notification. Download the syllabus below. Hall Tickets will be available from 22nd - 27th May 2019 in the TS PGECET 2019 official. Hall ticket contains details like candidate name, roll number, photo, exam date, time and venue etc. The TS PGECET 2018 results will release on June 2018 tentatively. Score/Rank card will be available after the release of results. Candidates can check and download the results and rank card from TS PGECET official website. 1) Test is of two hour duration with 120 multiple choice objective type questions, carrying one mark for each question. 3) Candidates must ensure themselves that they have chosen the correct test paper, which qualifies them to become eligible to seek admission to the specific program they are interested in. 5) The Hall-Tickets are to be downloaded from the website www.tspgecet.org. Without Hall-Tickets the candidate will not be allowed into the test centre. 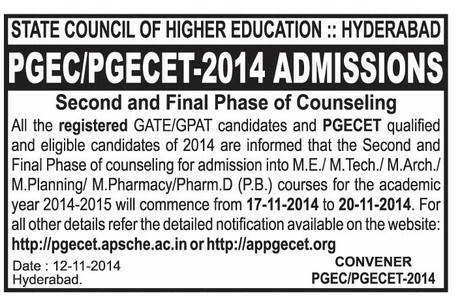 6) Separate Notification will be issued for admission based on GATE/GPAT Score. 7) Appearing in the test does not guarantee admission. The candidate has to satisfy all the requirements at the time of admission. 8) Candidate need to carry a photocopy of Caste Certificate duly attested to examination hall, if he/she belongs to SC/ST category. 9) For further information contact TS PGECET Helpdesk. Candidates have to pay the non-refundable counselling fee to appear in counselling process. 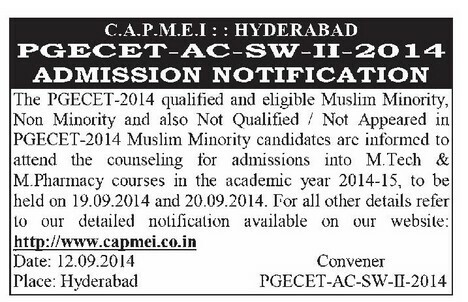 Candidates must attend the counselling procedure for documents verification and seat allotments. Candidates will receive the serial number and password on the payment of counselling fee through which they are able mark the choices for colleges as per their requirements. Q1. Where can I buy the Application form? Q2. Should I need to upload any certificates? Q3. If I wish to appear for more than one test which is scheduled on the same day in different sessions will I be allotted the same Test centre or different Test centres? Q4. Do I need to post the application form? Q5. Do I need to preserve the Registration ID? Q6. If I misplace my copy of the “Filled In Online Application Form”, how to get another copy of it? Q7. I did some mistake in filling the online application, then how it can be change? Ans. Mobile number is a mandatory detail as your Transaction Id., Payment confirmation or any other future correspondence is through the correct Mobile number you enter. Hence, if you don’t have a Mobile number enter the mobile number of your parents / guardian or close relatives / friends whom you can trust.